Any allergic reaction can be concerning for the person experiencing it. People tend to react in different ways to something that affects their body, and an allergic reaction to hair dye products is no different. Certain chemicals and compounds in some of the cosmetics we use every day can trigger reactions. Hair colorings are no exception. One of the key chemicals in most hair dyes is paraphenylenediamine (PPD). It is the main cause of most hair dye allergies. This article will cover how PPD works, and why it might harm your skin. 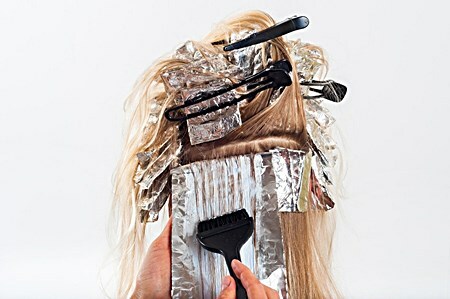 We’ll also go over the common symptoms, how long a reaction might last, and alternatives you can use to get the color you want without the harmful chemicals. An allergic reaction is your body’s way of trying to get rid of the substance that it doesn’t like. It may be a harmless substance, but your immune system will try to push it out of your system as quickly as possible. The more you know about your hair dye sensitivity and how to recover, the better. Why Am I So Sensitive to Hair Colorings? How Do You Identify an Allergy? How Long Does an Allergic Reaction to Hair Dye Last? What are the Best Ways to Heal from a Scalp Allergy? Are Alternative Hair Coloring Available? Can I Avoid a Reaction When Color-Treating My Hair? There isn’t a concrete reason why some people are more sensitive to certain substances than others. Some people have allergies and some don’t. In some cases, genetics can play a factor in what you’re allergic to, such as certain foods. Most research suggests that allergic reactions were once the body’s way of getting rid of parasitic infections. Now, they respond to triggers that don’t put us at risk for infection. The chemical that causes most allergic reactions from hair dye is PPD. It is a substance used to fight the fade of color. Technically, that’s what you want in a hair dye. Unfortunately, it’s also a well-known irritant for many people. It is found in both over-the-counter and salon-quality hair dyes. Some people just find that it makes the scalp feel overly dry and flaky. PPD is often found in darker (black) dyes, but recent research has determined that it’s present in almost two-thirds of commercial hair dyes currently on the market. The reactions can be severe if not treated properly. If using hair dye has bothered your skin in the past, but you’re not sure whether or not you’ve had an allergic reaction, it’s important to know the symptoms so you can be fully prepared. Again, allergies can affect everyone differently. In fact, you may have used a certain coloring product for years with no reaction, but suddenly it causes one the next time you use it. Allergies can develop at any point throughout our lives. So, even if you haven’t experienced one yet, it’s important to know the symptoms. Additionally, you should know the difference between a mild reaction to a certain substance, and an allergic reaction. Many of the more serious symptoms may indicate an anaphylactic shock. That’s an allergic reaction that develops within minutes after the substance has been introduced into the body. These symptoms shouldn’t be taken lightly and can have serious consequences without treatment. Just as reactions hit everyone differently, they can take different lengths of time to fade away. As stated above, severe reactions can happen within minutes. Contact dermatitis may take hours, or even a day or two for symptoms to show up. With proper treatment, the symptoms should go down within a matter of hours. However, in some cases, the milder symptoms can last up to a couple of weeks, even with treatment. The best thing to do if you experience a reaction of any kind is to contact your doctor. The sooner you’re able to get treatment and find relief, the better. If your symptoms do last, It’s likely your doctor will put you on some medication to reduce their impact on your daily life. Since hair dye contains so many chemicals, the best way to combat an allergy is to soothe the symptoms like irritation, inflammation, and redness with a natural product. Soothing creams and ointments are a great way to reduce the pain that can occur from allergies. If the painful symptoms from your reaction continue, you may want to talk with your dermatologist. They can usually prescribe an antihistamine. Antihistamines work well for more mild symptoms, but may not be enough to recover from a severe reaction completely. One of the best ways to avoid experiencing an allergic reaction from hair dye is to look for hair dye without PPD. Even if your reaction is mild, it could become worse in the future. Many people also find that the use of hair dyes cause dry scalp. So, it’s better to avoid the substance altogether. Because PPD has become a problem for so many people, hair color manufacturers have taken notice. There are now several quality PPD-free alternatives on the market. There are even alternatives from well-known brand names, like Clairol’s Natural Instincts. You can find hair coloring available for both men and women. Other products are made from ingredients like hemp and even quinoa. The more natural the ingredients, the better. They may not last as long as permanent dye containing harsh chemicals, but it’s a small price to pay to avoid a severe reaction. The best thing you can do when searching for a coloring product is to check out the ingredient list. Look for PPD on the box. Or, if you’re getting your hair professionally done, be sure to request a PPD-free dye. Keep in mind that even if a color doesn’t contain this particular chemical, it could still set off an allergic reaction. One of the other ingredients may be a trigger for you. However, you’re much safer avoiding dyes with PPD in general. Unfortunately, reactions are hard to avoid, because we often don’t realize we’ll experience them until it’s too late. However, there are some precautions you can take when coloring your hair. They can help you to avoid a larger and potentially severe reaction. Do a patch test. Even if you’ve used a specific dye a dozen times before, a patch test can help you to determine if you’ll have a reaction this time. To do it effectively, place a small amount of the solution on your body; usually behind your ear, or on the inside of your elbow. Let it dry and rinse later, following the instructions on the box. If you experience any irritation or reaction from the test, don’t use the product. Visit an allergy clinic. You can do a patch test there, as well, and they’ll be able to tell you what chemicals within the dye might cause an allergy. Then, you can be sure to avoid using products with those particular chemicals. This doesn’t mean you aren’t allergic to other things, but it will rule out or point out any of the chemicals you’ve been exposing yourself to that are causing irritation. Even if the patch test comes back clear, you should continue to take precautions when coloring your hair, especially if you’re doing it yourself. Always wear protective gloves, and be sure to follow the directions included with the dye exactly. Never leave it on for longer than suggested, and be sure to rinse your hair after using it thoroughly. The more you know about exactly what you may be allergic to or have a reaction to, the better. Things become easier to avoid altogether when you know the exact chemicals causing the problem. If you’ve never experienced an allergy to a product before but are concerned, an allergy clinic can tell you other substances you might be allergic to as well. Allergies can sneak up on you at any point in your life. Even if you never experience one, it’s always safer to go with a natural option. The chemicals found in hair dye can irritate your skin and cause issues like dry scalp, even if you’re not allergic. If you do experience an allergic reaction to hair dye, the best thing you can do is contact a doctor and get treatment right away. From there, you’ll have a better idea of what to avoid. Allergies are nothing to take lightly, and the consequences can end up in hospitalization if you’re not careful. By avoiding ingredients like PPD in your color, and choosing natural cosmetic products whenever possible, you’ll be giving yourself the best fighting chance against a severe allergic reaction or contact dermatitis and irritation. Seek out natural alternatives, and you won’t have to give up your favorite color. And don’t use shampoos that have a harsh affect on the scalp. We recommend using Christina Moss Natural Organic Shampoo.